Dec. 22 Update: With the Bitcoin price surging past $860 today, Vinny Lingham's May Bitcoin price prediction is within reach. He pointed out to Money Morning that his original call was based on the Bitcoin market cap hitting $15 billion. As of today the Bitcoin market cap is $13.8 billion. To reach $15 billion, the price of Bitcoin need only reach $934 by Dec. 31. "I'm pretty happy with my call, regardless," Lingham said. A Bitcoin price prediction of $1,000 by the end of 2016 might seem over the top — except that the person making it is two-for-two in his previous predictions. I'm talking about Vinny Lingham, a familiar name in the Bitcoin universe. He gained notoriety among cryptocurrency fans by founding mobile gift card app Gyft in 2012. Gyft allows customers to buy gift cards with Bitcoin. Lingham left Gyft in January to found a new startup, Civic, which focuses on digital identity protection. It uses the Bitcoin blockchain to help prevent identity fraud. His Bitcoin price predictions have been infrequent, but on the money. Lingham made his first Bitcoin price prediction at a Bitcoin conference in San Jose in May 2013. At that point, the Bitcoin price was fresh off a run that took it from about $13.50 in December 2012 to $266 in April, then a drop back down to the $115 range. Lingham boldly predicted that the price of Bitcoin would hit $1,000 by the end of 2013. The audience chuckled at his audacity. While many Bitcoin enthusiasts felt the digital currency would get back to $266 or even $300, few thought it would reach $1,000 so quickly. And yet in late November of that year – just six months after the conference – the Bitcoin price soared past the $1,200 mark. On the one hand, everything had changed. The Bitcoin price had plunged nearly 60% from its late 2013 highs, to about $500. The Mt. Gox exchange had collapsed. But the Bitcoin community remained undaunted. Bitcoin price predictions of an imminent return to $1,000 — and not long after that, $2,000 — were typical. Except for Lingham. He flat out said the Bitcoin price would not revisit $1,000 in 2014. Instead, he foresaw a lengthy period of Bitcoin price consolidation in the $350 to $550 range. And that's very close to what's happened, with Lingham somewhat off in his estimate for the lower bound. It turned out to be closer to $200 than $350. Now, a little more than two years later, Lingham has weighed in again. This time he's bullish, predicting a Bitcoin price of $1,000-plus by the end of 2016. In his latest blog post on the Bitcoin price, Lingham says that the headwinds he saw two years ago have reversed into catalysts. Consumer adoption of Bitcoin catching up to merchant adoption. There's tremendous interest in the blockchain, the technology that underpins Bitcoin. Over the past year, the Bitcoin price has trended up, giving it positive momentum. The Mt. Gox fiasco is mostly forgotten. Today, customers trust the Bitcoin exchanges. Just these catalysts alone, Lingham says, should be enough to get the Bitcoin price to $1,000 by the end of the year. But Lingham also sees several additional catalysts that will help push the price of Bitcoin to $1,000 – and well beyond. First, he thinks the interest in blockchain technology, which for the most part has looked to exclude Bitcoin in favor of private blockchains or blockchains based on other cryptocurrencies, will circle back to Bitcoin's. "We will live in a world where there is a 'chain of chains,' all interlinked in some way," Lingham says. "Bitcoin may not rule the finance world chains but it may act as an intermediary platform for settling across chains." Second, he believes the July 11 halving of the block reward to miners from the current 25 bitcoins to 12.5 bitcoin will trigger a short squeeze. Lingham's theory is that traders have borrowed bitcoins from exchanges to sell into the market, thinking the Bitcoin price will drop. Miners often borrow coins to sell as a way to lock in profits. But after July 11, they'll be mining half as many bitcoins, making it harder to repay what they owe their exchange. So they'll have to buy bitcoins, driving up the price. If the price of Bitcoin spikes as a result of miner buying, the traders that are short will also have to jump in to avoid getting huge losses. The halving also cuts the supply of new Bitcoin, which should have a deflationary impact. Fewer bitcoins with roughly equal demand should push the value higher. Finally, Lingham thinks that governments will start to buy Bitcoin as a strategic investment. It's not that far-fetched, as governments already like to buy gold. And Bitcoin is essentially digital gold. "Imagine if China started buying up large amounts of Bitcoin — would the rest of the world governments stand idly by and watch? I don't think so — so my prediction here is that by 2017, governments will become the largest buyers of Bitcoin, pushing the price up to new highs," Lingham says. 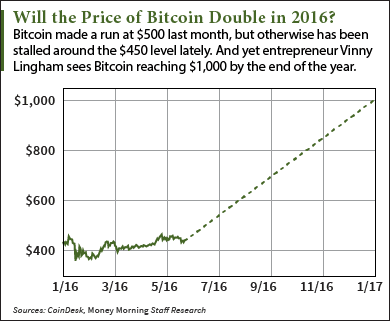 Lingham sees the forces that will push the Bitcoin price to $1,000 in 2016 continuing to drive prices higher in 2017, when he predicts it will break $3,000. That's a gain of 567% from today's prices. As crazy as that seems, Lingham's call is not out of line with two predictions from top-flight Wall Street analysts. Needham & Co. has a target of $1,896 by 2020. And Wedbush Securities has forecast a Bitcoin price of $17,473 by 2025. The Bottom Line: A new Bitcoin price prediction from an entrepreneur with a knack for making accurate calls on the digital currency sees multiple catalysts driving Bitcoin much higher over the next two years. He has forecast a double to $1,000 by the end of 2016 and an explosion to $3,000 by 2017. Vinny Lingham: Bitcoin 2016 - "There has been an awakening…"
In fact, the only way existing bitcoins will be affected is by an increase in value as the supply is cut in half. Anticipation of that may be playing a part in the recent spike in the Bitcoin price (over $490 as I write this). You will have the same amount of BTC after the halving. Halving only affects the mining rewards. So,how does one go about investing in bitcoin ? What's the best way to by bitcion. And where. when looking to invest in bitcoin, is it better to buy bitcoins using an online wallet, or invest via a broker? Thanks for reading Money Morning. Few brokers at this point can help you buy bitcoins, so you're better off buying them yourself. The biggest issue here is security. Storing your bitcoins with an online exchange has proven to be risky; the exchanges often get hacked and the bitcoins stolen. It's much safer to have a bitcoin wallet on tour PC that you control. Here's a link to the Money Morning Bitcoin Guide.